Among the reforms announced by Chavez is the “no transfer” policy of the POLO of distressed Filipino household service workers (HSWs) who ran to the FWRC to seek refuge after experiencing various forms of abuses from their employers. “We are not going to transfer anymore any ward under our custody to another employer. They need to go home especially those who have filed maltreatment complaints against their employer after resolving all their cases and getting the compensation due them,” he explained. In the midst of the human trafficking allegations involving some Philippine Embassy and POLO personnel in Kuwait and the ongoing investigation by concerned authorities in the Philippines, Chavez declined to comment further on the issue and stressed that let the investigation roll. He also called on Filipinos in Kuwait not to judge quickly as everyone is presumed innocent unless proven otherwise by the court. Chavez outlined that they will no longer allow wards to go out of the FWRC without legal papers and without any POLO staff accompanying them. He added that they will not also allow the wards to speak to anyone without the presence of a case officer. Moreover, he stressed that a CCTV camera is placed in various parts of the POLO building to monitor the wards and those who come in and go out 24 hours. “We are monitoring strictly all the movements. Just in case, you get to know any ward was able to slip in and out of the centre without our knowledge, I urged the Filipino community leaders to report it to us,” he stated. Meanwhile, some Filipino community leaders aired their sentiments about the human trafficking issue that has hounded the embassy and POLO in the past weeks in the Philippine media as well as social media that has subjected those allegedly involved to trial by publicity. “In my own opinion, we have to help one another as Filipinos. Whatever that embarrasses the embassy, the OWWA, also embarrasses us as Filipinos. We should not go around talking about this. If we can keep the issue under wraps, then let’s do it. But whoever is at fault and whoever erred should face the law because we have laws and we should follow the law,” pointed out Mohaimin Dipatuan Ali of Sinar sa Kuwait. He added that in his 14 years in Kuwait, he has seen how the embassy helped Filipinos in Kuwait. During the forum, Chavez also announced the strict implementation of the US$400 (approximately KD110) salary for Filipino household service workers effective December 2013. “If we discover that the manpower agencies are not following the required $400 salary of the HSW then we will revoke their accreditation from the POLO and they can no longer process papers here with us. If a household service worker runs to us and executes an affidavit that she is receiving below $400 then the manpower agency will not be allowed to do any transaction anymore,” he explained. 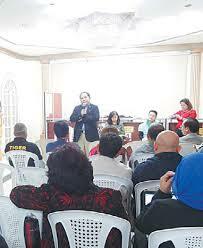 The Filipino Association of Secretaries of Employment Agencies in Kuwait (FIL-ASEAK) met with Chavez in December last year and expressed support to the required salary for HSWs. “We are bound to follow this and we have to do it, otherwise, we will be losing our jobs. Thank God, so far, as of now 90% of the manpower agencies have been following the KD110 salary for HSWs,” stated FIL-ASEAK President Maripol Abdallah. Among the other programmes of the POLO is the construction of a comprehensive database of all OFWs in Kuwait. “Within three to four months we hope to complete the database that will contain all the details of Filipino workers in Kuwait. We will know all the details of HSWs, their address, details of employers. We will have all the accurate information.